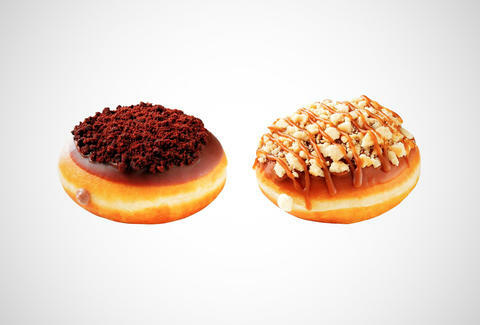 Not content to rest on its "most craveable" laurels, Krispy Kreme hit the streets with two new donuts that you're definitely going to wanna freebase. From now until January 26th, the chain is slinging a pair of cheesecake donuts ripe for inhalation. For the chocolate lovers, there's the chocolate cheesecake donut, a decadent snack featuring a rich chocolate icing and tufts of brownie bits up top. For the chocolate lovers who also want other sugars, there's the caramel cheesecake donut, which ditches the cocoa for a graham cracker crumble and caramel drizzle. Both are available now in America and Canada, but only for three weeks... so ditch that New Year's resolution to get skinny for a more realistic one of eating as many of these as you can in three weeks.